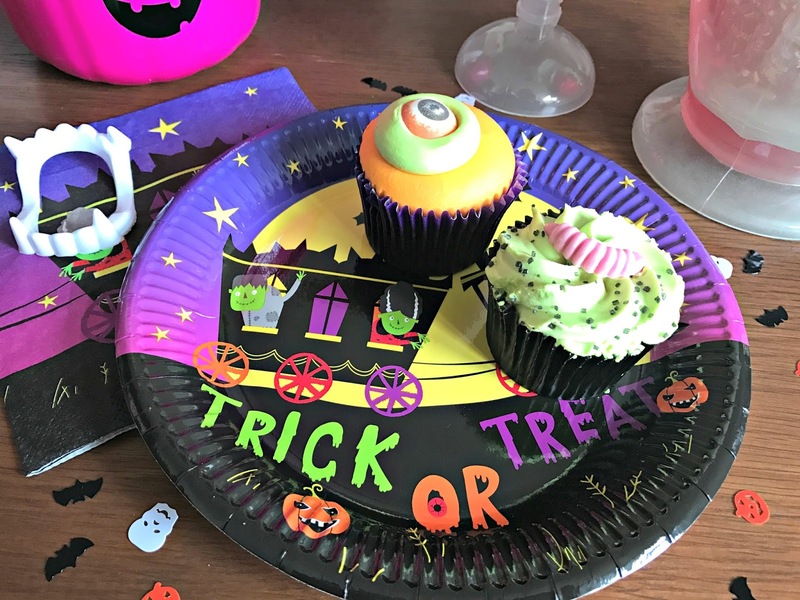 We love Halloween - sweets galore, a chance to dress up and a day of fun as a family. What's not to like? 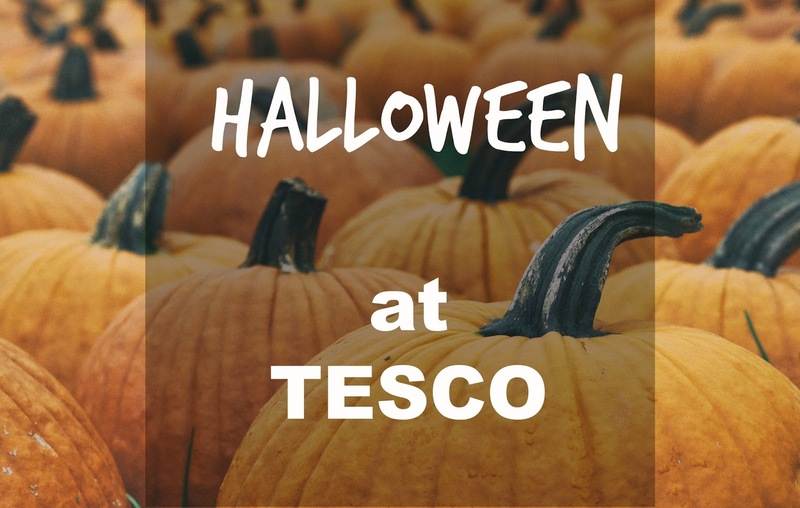 We have hosted many parties over the years, inviting the Mini Mes' friends along too, and with everything from spooky costumes, treats and tableware, Tesco is the place to visit this October. We popped along to our local branch in Daventry and despite being quite a small store in comparison to some, the shelves were stocked with all of the essentials and more! 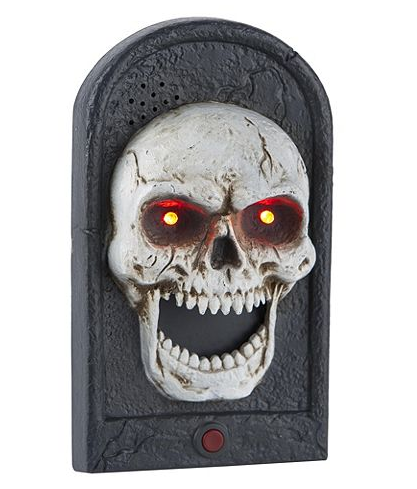 The first item we purchased was this rather cool doorbell (£7) to transform our home into a haunted house ready for those Trick or Treaters. Jamster jumped out of his skin when he tested it, which we all found hilarious, and he was eager to shock guests in the same way. The eyes light up, a snake pops out and it says several phrases once pressed so it's ideal for the front of your property. 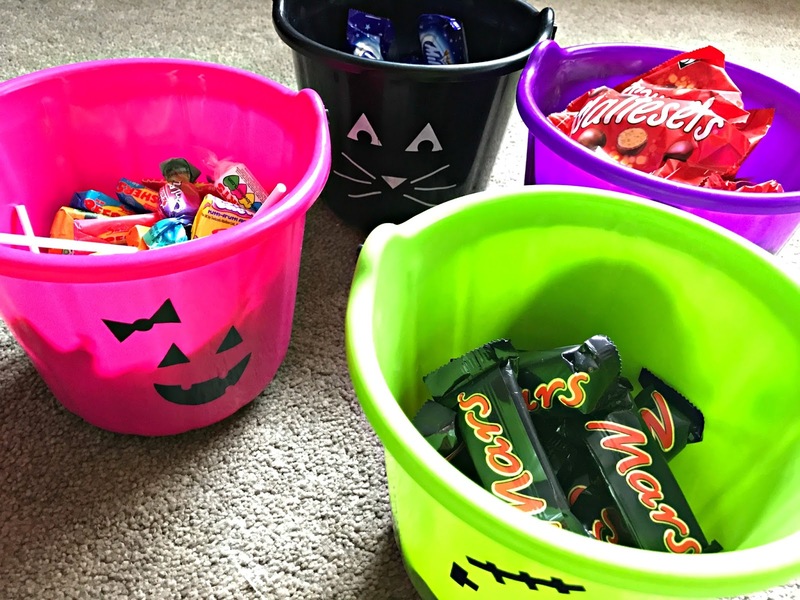 Every trick or treater requires something tasty to eat so we picked up a Haribo Scaremix box containing 50 mini bags (£4) 2 Swizzels Spooky tubs (£5 each) containing over 100 sweets and bags of fun-size Milky Ways (£1.39), Maltesers (£1.39), Mars (£1.39) and Twix (£1.39) to ensure we are really stocked up for Monday. Any leftovers will be great for lunchboxes or for some seasonal baking too. The plastic loot buckets are superb value with different images and colours available to suit varying costumes. At only 50p each I got 10 ready to fill with goodies for our close friends as gifts. There are even special treats available for pets so Spartan wont be forgotten! There was a good range of costumes with items available for pets, babies and tweens. 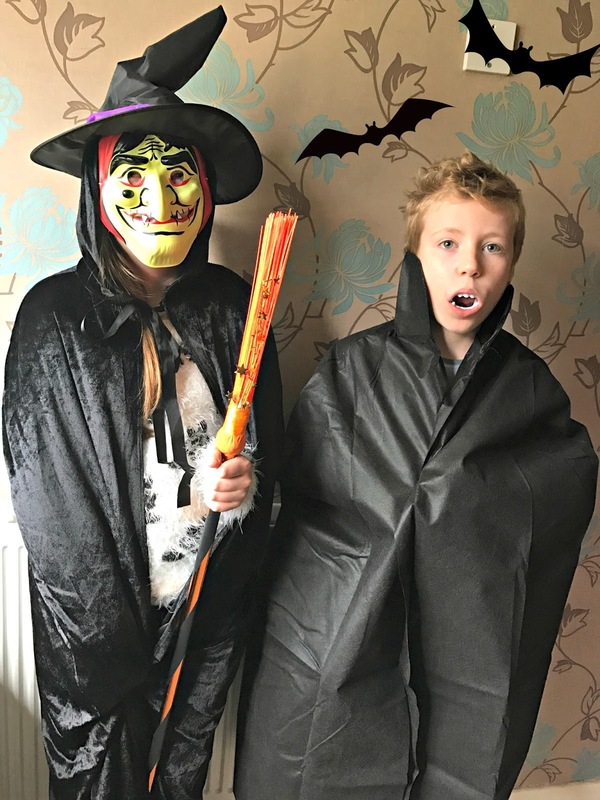 Jamster has opted to be a vampire this year so he selected a cape (£1.50) and fangs (15p) for his outfit whereas Minxy chose a cloak (£5), mask (50p), hat (75p) and broom (£3) to complete her witches look - all very affordable for anyone on a budget. We thought the pack of 3 snap bands in particular were a great idea to ensure everyone is seen when out in the dark (£1). It's nice to see providing safety products is important to the supermarket whilst also providing items for having fun. When it comes to decorations we were really impressed. There were different card plates (£1), napkin (£1) and cup (£1) designs available which are easy to dispose of at the end of the night as well as glow in the dark pitchers (£4), goblets (£1.25) and tumblers (£2) to put away and reuse for years to come. The confetti (75p) is also nice to sprinkle on the table or to pop in loot bags for a little extra magic. There really was plenty to pick from whether your hosting an intimate family buffet or a real feast with lots of visitors planned. The cupcake platter was incredible for just £6. Each cake is filled with jam or chocolate and the frosting is really bright and attractive, even if they feature magots and eyes! 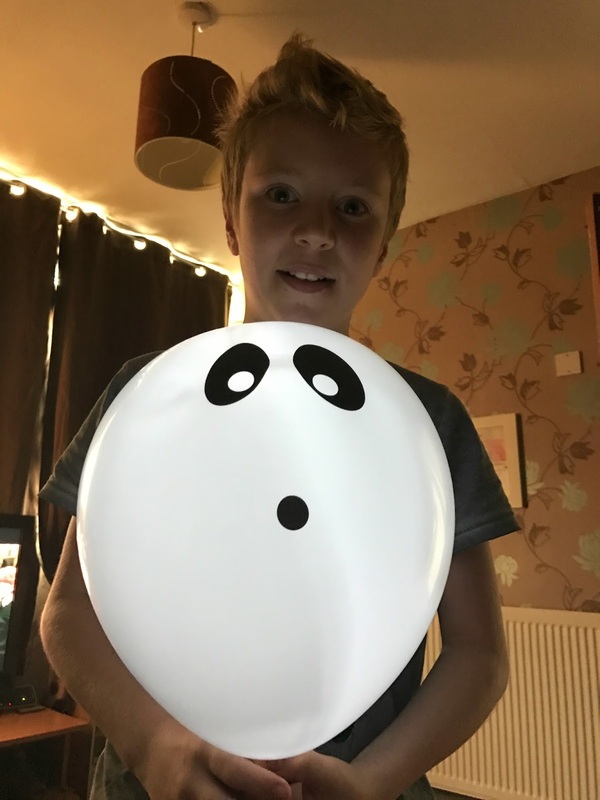 We really enjoy making the outside of our home look spooktacular so we thought the caution tape (£1), honeycomb hanging ghosts (£1.50) and balloons (£1) were ideal to add to our existing collection for display. The illooms led balloons were also appealing as it means no candles are required making it an even safer experience for all - what a fantastic idea. We selected the ghost (£3.50) and pumpkin (£3) versions to try. They are really easy to activate and they glow for around 15 hours each. Finally, no Halloween is complete without a pumpkin! Tesco have 2 for just £3 and carving kits at £1 so whether you want to make soup, pie or just cut them into lanterns you won't be breaking the bank. We are really looking forward to printing off some cool templates for ours. Some great deals out there for Halloween! We enjoyed our night too! The illooms led balloons are a great idea!